Husband and Wife a true life partner who living their life happily even they are different from each other and still want to stay together whether if they fighting every day or later say sorry and then loving each other as a true soul mate live. There are many little and special moment a couple living when they get a little time to spent, all that little and special moment together make a wonderful life of Husband Wife. No doubt that every couple are fighting, shouting for any matter, don’t talk with each other for a couple of days but they know that they can’t live without each other. 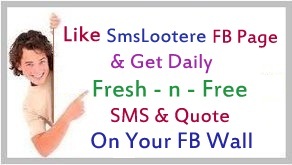 SmsLootere.com team has again got a great collection of Husband Wife SMS in English, so share this collection with your Spouse and makes them special. But not Like ‘Fish & Fisherman’. Husband and Wife have a Solemn Responsibility to Take Care for One Another.. Play Like Kids, Argue Like Husband & Wife, and Protect Each Other Like Siblings. Though they are Teasing and Fighting but can’t Live without Each Other. But a Great Husband Listens to the Story of why She’s Crying. Loving Her and Protecting Her. The Relation Between ‘Husband & Wife’ is Like, the Relation Between Hand & Eyes. If the Hand gets Hurts, the Eyes Cries, & if the Eyes Cries the Hand Wipes its Tears. A Wife and a Husband, a Mother and a Father. One Is Psycho and the other is Logical. Husband- I want Divorce. My Wife hasn’t Spoken to Me in 6 Months. Lawyer- Think about it Once Again, Wife Like that are Hard to Get! Never Be Proud of Ur Choices; Ur Wife is 1 of them. Wife- why will U Die? Husband- bcz I can’t Bear the Excitement when U Die. A Wife said 2 Her Husband- U Know, I was Fool when I Married U. Husband Replied- Yes Darling, but I was in Love & didn’t Notice. Wife- I am not Talking to U.
Wife- don’t U want to know the Reason? Husband- no, I Respect & Trust Ur Decision. Wife- what can u do 4 Me? Husband- I can Eat Maggie 4 U.
Wife- awww.. That Much U Loves Me..
& thinking that She is Giving Punishment to Him. A Man’s Angry wife Packed His Bag and said ‘Get Out’!!! Thinking that She will still Follow His Orders as B4!!! Because God could have Created Some1 as Caring as U. Thanks for be with Me. But I Promise You, that the Best is yet to Come.. I Loved.. You Love Me Back Even More..
Just Melt Away when You Smother Me with Your Kisses. You make My Whole World Go Around. You make My Whole World Stand Still. You make Me the Person I am! Husband and Wife are Like a Pair of Scissor. Joint Together, often Moving in Opposite Directions yet Punishing Whoever comes between them. I’ll Permanently Go to My Mother’s House. Wife – what is 10 Years with Me? Wife – what is $1000 for Me? Wife – ok give Me a Coin. Husband – Wait a Second! Wife – Honey, what are You Looking for? Wife – why have U been Reading Our Marriage Certificate 4 an Hour? Husband – I was just Looking 4 the Expiry Date. Lady – how does Your Husband come Home on Time Regularly? Then do You think I’ve Downloaded these from Internet? Wife – You had Lunch? Husband - You had Lunch? Wife – I am asking U. Husband - I am asking U. 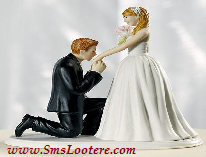 Wife – U Copying Me? Husband – U Copying Me? Wife – Let’s Go Shopping. Husband – I had Lunch. Marriage is a Relationship in which One Person is always Right & the other is Husband. In this World Everybody makes Mistakes..
Remembering them and Reminding them. Man – How do You Please Your Wife? Man2 – when You are Wrong, admit it. When You are Right, Shut Up. Judge – why did You Beat Your Husband’s Head with a Chair? Wife – because the Table was too Heavy for Me to Lift.